Is an aquarium heater important? If you have tropical or marine inhabitants in your aquarium, then the answer is yes. The aquarium heater warms up the tank’s water temperature according to what your fishes require which is usually around 78 degrees up to 82 degrees. It’s necessary to get one so that your fish will thrive healthily in your tank. This article will help you learn more about heaters and discover some of the best aquarium heaters available. Angelfish, Bala shark, Banjo Catfish, Barbs Betta fish, Black shark, Bloodfin, Cichlids, Danio, Discus, Rainbowfish, and Tetra fish. Generally, tropical fishes cannot withstand cold temperatures as this can lead to the deterioration of their health, even premature death. Unlike non-tropical fishes which can survive even at the lowest temperature , tropical fishes are extremely sensitive to the cold. Submersible - the submersible type of aquarium heater warms up the tank efficiently. It lies below your tank’s water level and must be kept submerged or else it can be damaged. It can be positioned either horizontally or vertically inside the tank. The clips and suction cup holds the heater in place. Usually, the submersible heater is placed just below the filters output. Hanging – from the name itself, this type of heater is typically hanged off the top edge of the tank, secured at the back. Its temperature controls can be accessed to the portion that is laid outside of the tank. The hanging heater must be placed below the surface of the water to prevent being damaged. Substrate – compared to the submersible and hanging heaters, this particular type is not commonly used by aquarists but ideal for planted tanks. The substrate heater, in the form of an insulated coil wire, is buried under the aquarium gravel or substrate and emits heat that warms up the water. In-line – before the water from the filter hits the tank, it is already warmed by an in-line heater. This particular type of external heater is attached to a section of the external plumbing that pumps water to the filter and heats it as it goes through. In-filter – there are some aquarium filters that offer the inclusion of built-in heaters. As the water passes through the filter, the built-in heater inside it also radiates heat. The water goes back to the tank clean and heated. In-sump – this type of aquarium heater can be found in the sump of a trickle filter. These types of heaters typically have the standard parts such as the envelope which keeps the internal components from getting wet, the heating element which is a piece of resistance wire that is energized via the electric supply, and the temperature adjustment button. Most of the internal heaters come with suction cups. Use them to place your heater on the side of your aquarium tank. If your heater does not come with a temperature gauge, we suggest that you get one. This can help you in monitoring the temperature and the environment of your tank. Use the thermostat to switch the heater on and off as necessary. When using an internal heater, always keep the water level higher than the heater to prevent heater failure. Let the aquarium water heat up first. Give it at least an hour before you start adding fishes and turn the heater on. This will prevent the glass from breaking due to temperature difference. There are some guidelines that you need to know before buying an aquarium heater. When you choose a heater, choose one that is compatible or well-suited with your tank. A drop in the water temperature can be dangerous to your fish especially if you own tropical ones. To maintain the right temperature of your tank, remember that the heater size matters. This rule should always be applied when you scout for aquarium heaters: you must have three to five watts per gallon for every 10° Fahrenheit above room temperature in order to thoroughly heat the tank and maintain that temperature. If you need more heating source, we recommend that you use several heaters instead of getting strong and large ones. If you want to know more, here is a video about choosing the right aquarium heater for you tank size. A variety of aquarium heaters can be found and bought nowadays. You spend money on this important piece of aquarium equipment for the well-being of your aquarium inhabitants. However, it should be money spent wisely. You must have the best because your fish deserve all the proper care that they can get. Here are just some of the best aquarium heaters that we could find. The Zacro submersible 300-watt aquarium heater is fully submersible and is made of glass. It is ideal for aquariums that are 53 up to 99 gallons in volume. It has a visible temperature setting that can be easily set and adjusted. It allows you to calibrate the temperature ranging from 65 up to 93 Fahrenheit or 20 up to 34 centigrade degrees. It is made from waterproof materials and features double insulation. This aquarium heater assures prospective buyers of its durability because the product is made from insulated glass of high quality. You don’t have to worry about scalding when using this heater since it has a dependable protective container. This aquarium heater has an operation with a heating cycle of five to ten minutes before it stops and starts again after the interval period. Suction cups keep the thermometer & heater stable. Cycles properly and slowly up to the desired temperature. Water temperature can be kept at a set temperature. Comes with an extra LCD digital thermometer for ensured temperature accuracy. It randomly turns on and off when it wants. Issues with maintaining the set water temperature. The Cobalt Aquatics NEO-Therm heater can be fully submerged on different types of aquariums such as freshwater and saltwater tanks and terrariums. This modern, sleek, stylishly designed electronic heater that works on 25 watts, features an easy and simple way to set the control system with its one touch button. The design is not the only selling point of this aquarium heater. It is durable and shatterproof. Its cutting-edge electronic thermostat is very accurate. Its LED feature can display both the set temperature and tank temperature at the same time. It allows you to change the temperature range to 66 degrees Fahrenheit up to 96 degrees Fahrenheit. This product assures optimum safety and reliability to its users through its integrated thermal protection circuitry. This is a good feature since it turns off the heater before it can overheat. Thin, sleek, and flat design that takes up less space. Well-designed bracket system with 2 suction cups. Easy temperature setting with a press of a button. Maintains tank water temperature regardless of room temperature. Temperature fluctuation issues in cold regions. Changing the temperature can be difficult. Suction cups failure after a few months of use. The Aqueon 50W Pro heater is a well-performing heater. Just like the previous heaters, this one is also fully submersible and compatible with fresh or saltwater aquariums. It offers most of the necessary things that you would want your heater to have. Its electronic thermostat is accurate when it comes to temperature setting. The ceramic build is both reliable and durable. It is shatterproof and nearly indestructible thanks to the good quality of the materials it is made of. It is also an uncomplicated piece of equipment to use. Comes with a six-foot cord. Issues with temperature dial accuracy. 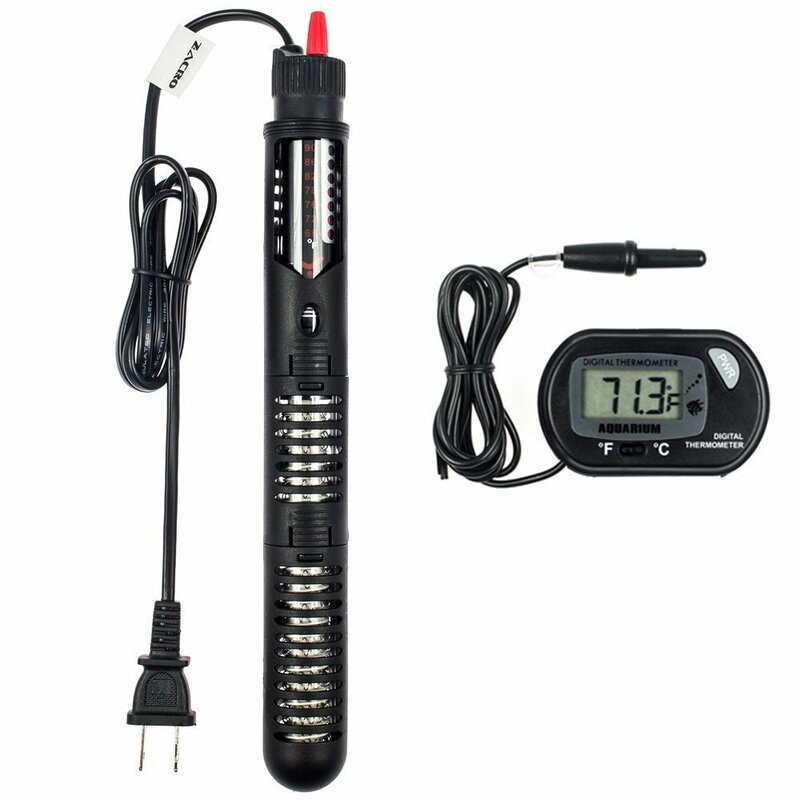 The Tetra HT Submersible Aquarium Heater is perhaps the most affordable aquarium heater from this list. 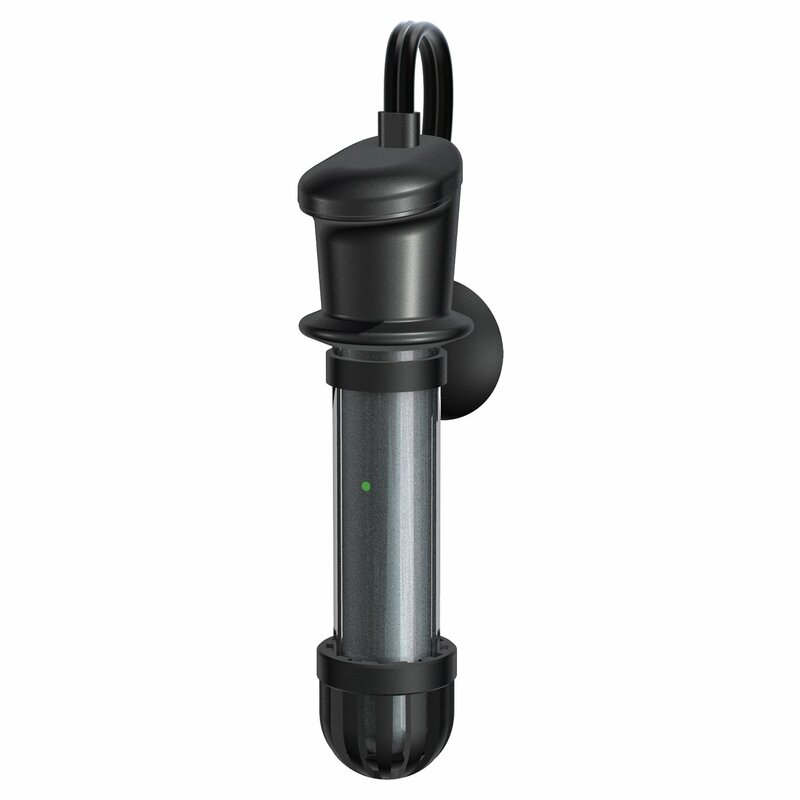 This product is fully submersible and can be installed vertically or horizontally inside your tank. Its small size makes it easy to conceal behind plants, rocks, or other aquarium decorations. It has a variety of features including its red(when heating) and green(when on standby) indicator lights to signal the heating status. This heater is ideal for aquariums between 2 to 10 gallons of water. Ideally it should be used for tanks with hood or a glass canopy in order to contain the heat inside the aquarium. The low voltage thermostat maintains water at 78 degrees Fahrenheit requiring any adjustment to it. A precautionary addition to the heater is that it automatically shuts off whenever overheating is detected. Convenient red and green light temperature indicators. Temperature cannot be changed or set. The Hydor In-Line External ETH Heater introduces a different way of performing heating tasks with its patented PTC heating technology. Instead of being submerged underwater, this heater is placed outside of the aquarium. This external heater is suitable for marine and tropical aquariums. It has a safety feature that self-limits the heating element to prevent any risk of overheating. This heater is designed to be used on return lines coming from canister filters or sumps. It has a highly accurate electronic temperature control and temperature setting. It is easy to use and effectively prevents variations in temperature. Issues with built-in thermostat failing. Aquarium heaters are important. It is an aquarium equipment that you must get, especially if you have tropical fishes. Temperature changes day and night. You can’t always be sure that the temperature of your tank’s water consistently stays at a safe level for your fish. Getting an aquarium heater can be a great investment if you are not willing to risk the health of your fish. 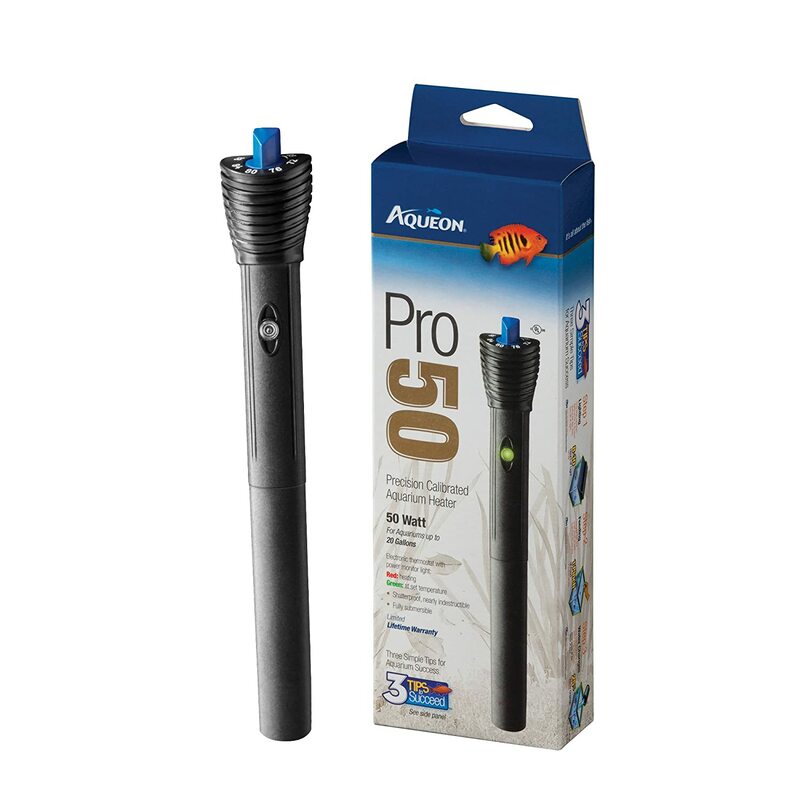 So, from the list of the best aquarium heaters above, we recommend the Aqueon 50W Pro Heater. Its price is budget friendly and the cons far outweigh the pros. You can check the other aquarium heaters from the list if you don’t agree with our choice.